During the 5,000-year period from -1999 to +3000 (2000 BCE to 3000 CE), Earth will experience 11,898 eclipses of the Sun. The statistical distribution of eclipse types for this interval is as follows : 4,200 partial eclipses, 3,956 annular eclipses, 3,173 total eclipses and 569 hybrid eclipses. All the data accessed through this interface is provided by Fred Espenak and Jean Meeus (NASA Technical Publication TP-2006-214141). The data available is described in greater detail in the Key to Solar Eclipse Catalogs. Years in this catalog are numbered astronomically and include the year 0. Historians should note there is a difference of one year between astronomical dates and BCE dates. Thus, the astronomical year 0 corresponds to 1 BCE, and astronomical year -1 corresponds to 2 BCE, etc. 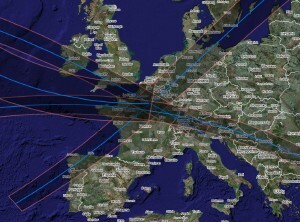 This Web page will let you determine the visibility of eclipses at a specified location, retrieve detailed information, create on-the-fly Google Maps and Google Earth kmz files for each of the 11,898 solar eclipses (total, annular, hybrid or partial). Be aware that the uncertainty in Earth’s rotational period expressed in the parameter ΔT has an impact on the geographic visibility of eclipses in the past and future. Know more about ΔT retrodiction or 5MCSE’s ΔT model. The umbral or antumbral northern and southern limits of a solar eclipse are plotted in pink while the central line is blue. Download the Google Earth application to use the kmz files. To get tailored data of recent or upcoming solar eclipses, you may also visit the interactive Google Maps or the Google Earth kmz files Web pages. Enter the criteria, and then click on the Search button (don’t forget to read the instructions to know more). Select one or more eclipses, and then click on one of the four action buttons to the right. The last three buttons are for my own use. Last page update on March 8, 2007.